Designed for work demanding a higher reach, the Afron HAS range provides a selection of heavy duty platform. They can be used for picking, pruning, and cultivating in orchards with tress from 20 feet (6 meters) to 31 feet (9.5 meters), and yet retain the easy to operate and hard wearing features of all Afron models. 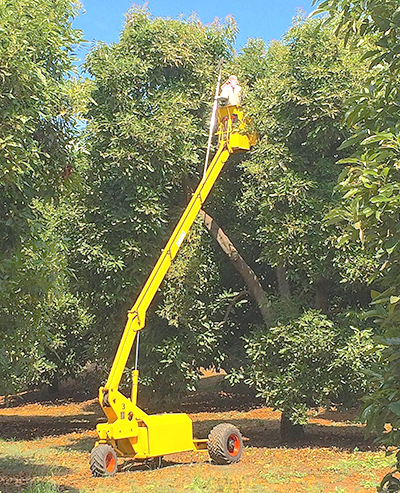 Afron pruning and picking model HAS 650 features an exposed levelling rod which provides an extra low pivot point, enabling movement through tightly planted avocado groves without damage to low hanging branches.